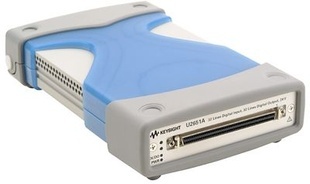 The Keysight U2651A USB Digital I/O is a cost-effective device with its offering of 64 opto-isolated digital lines. It comes bundled with the Keysight Measurement Manager (AMM) software for quick set up and data logging. Simplifying this further is the command logger function offered in the Keysight Measurement Manager that allows capturing of configuration commands that can be easily converted to snippets of VEE code. Other supported languages are VB, C++, and C#. Giving users more flexibility, the U2651A is compatible with a wide range of application development environments such as Keysight VEE, MATLAB® R2007a, NI LabVIEW and Microsoft® Visual Studio®. The U2651A works together with an optional U2903A or U2904A terminal block for easy connections. With high voltage protection of 1250Vrms, the U2651A is ideal for industrial automation and control.